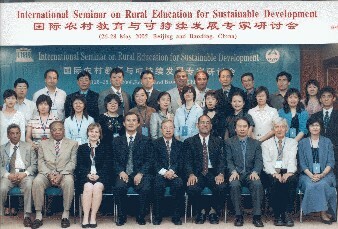 The UNESCO International Research and Training Centre for Rural Education (INRULED) organized - from 26 to 28 May 2005, in Beijing and Baoding, China - an ‘International Seminar on Rural Education for Sustainable Development’, in collaboration with the Chinese National Commission for UNESCO and the UNESCO Beijing Office. Development partners, which included FAO, World Bank, UNICEF, ILO and Ford Foundation joined forces together with the UNESCO partners plus 26 education experts from Australia, Bahrain, China, India, and Ethiopia to generate strategies to achieve the goals of EFA particularly for rural education for sustainable development. The Seminar was organized within the framework of Education For All (EFA) with three objectives: i) to present quality research papers and exchange preliminary research findings on major aspects of EFA in rural areas for sustainable development; ii) to develop conceptual framework and guidelines for valid-reliable systematic data collection, policy-relevant analysis and case studies on evidence-based innovative practices in rural education; and iii) to further strengthen networking of scholars and centers of excellence in accomplishing research studies on rural education for sustainable development. The "Education for Rural People" or "ERP" flagship was presented by FAO during the seminar. A "Summary and Recommendations" of the seminar is being finalized together with a seminar report. Areas for collaboration, especially regarding education research relating to rural people were identified and information shared. Networking was also facilitated.